Do you consider yourself to be a romantic in nature? You know…flowers, candle lit dinners, chocolates and a nice glass of wine? What about your decorating style? I’m sharing 10 ways to imbue romantic style home decorating, taken from my own signature style. 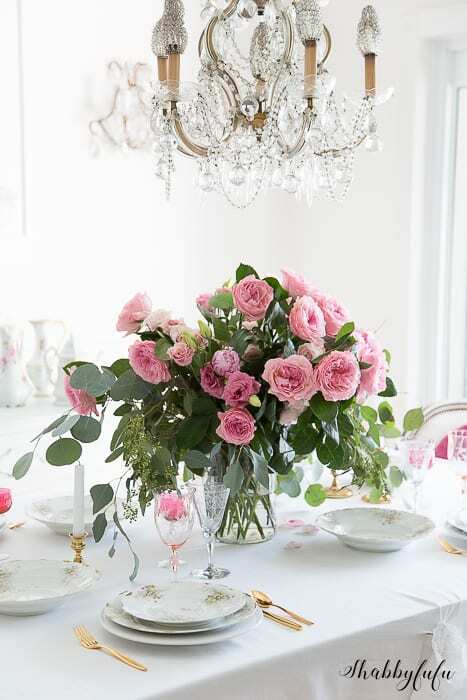 You can add casual, soft and has subtle touches of romance without being over the top! 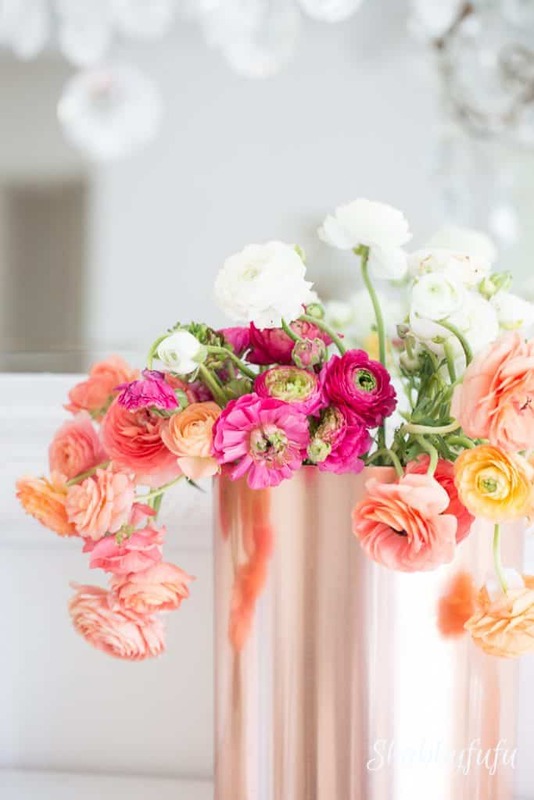 Fresh flowers such as roses, ranunculus, hydrangeas and hyacinths are a simple way to add a burst of color and fragrance to your home. 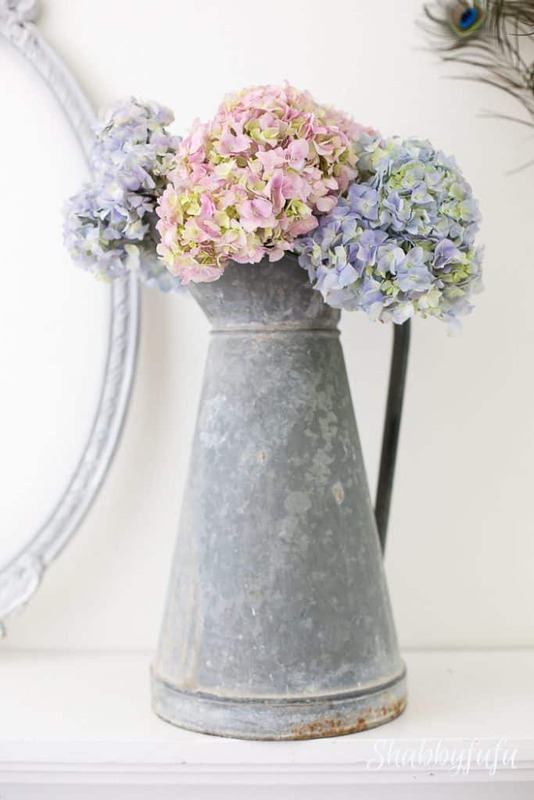 Think of adding your flowers to a worn vintage ironstone pitcher or for a container that won’t compete with the arrangement, use a clear glass vase. Stuff it full and loosely and create bountiful beauty in your bouquet. I found this similar “LARGE COPPER BUCKET” you might be interested in. Vintage chandeliers have long been a passion of mine and are the jewelry to your room. I prefer them to be dripping with crystals and have at least one in every room in my home. 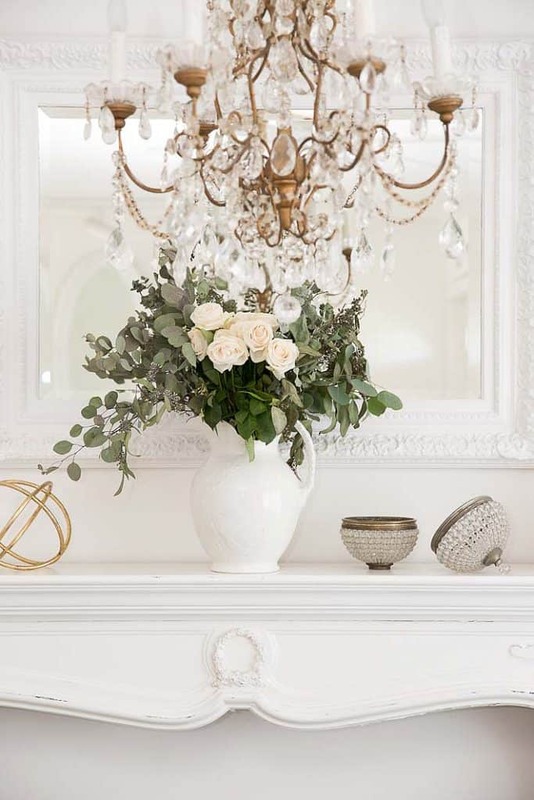 If you are going to splurge on one decorating item I recommend finding a stunning showstopper of a chandelier and sometimes (depending on the room) you can hang two or three. We hang all of our chandeliers with dimmer switches to create a soft ROMANTIC atmosphere. To soften up the look of a sofa or chair, a pretty printed pillow or one with ruffles will give it a cottage feel. 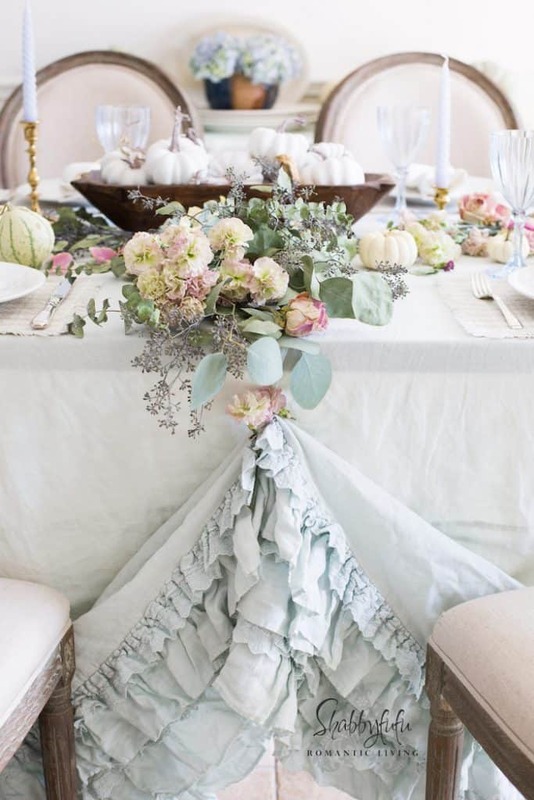 For your dining table, dress it up with a white linen tablecloth or once again…layers of ruffles. I often use my Shabby Chic duvet covers as tablecloths, turning a pricey item into a something with more than one use and justifying the cost. Consider faded floral fabrics, as you’d often find in the English cottage style outlined in THIS POST. A timeworn mantel has been incorporated into both the living room and master bedroom in our home, giving each room a focal point and a shelf to arrange vignettes. You can often find vintage mantels in antique stores and at flea markets and they are generally quite affordable. Look at them as a major piece of art for your home. 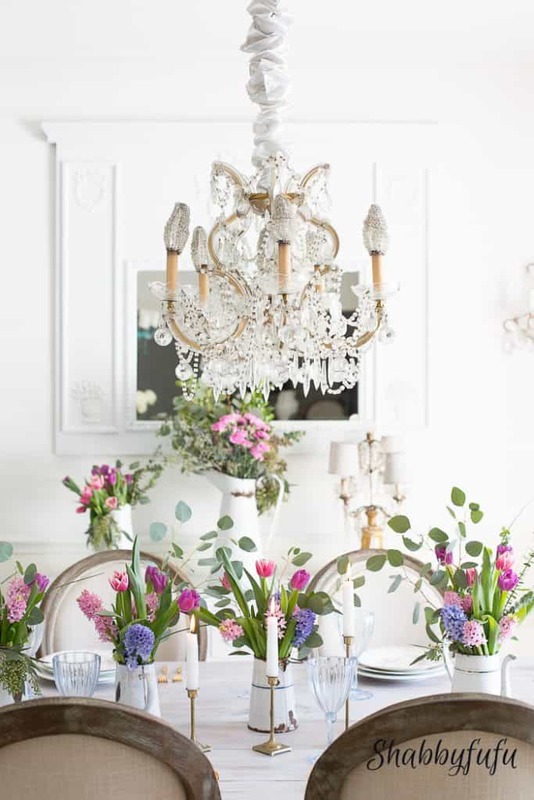 For the glow and fragrance add some dinner tapers to your dining table. If a holiday is approaching I will leave my table set with a centerpiece of flowers and candles all week long. 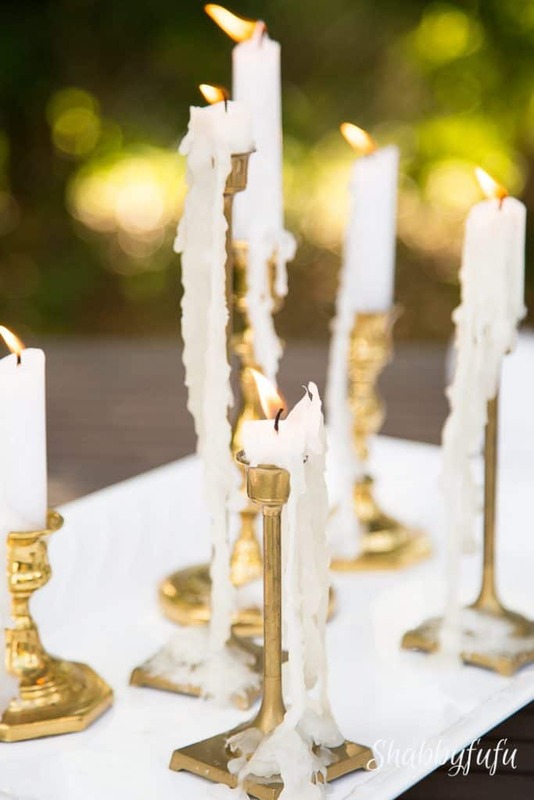 Candles are a great and inexpensive way to add charm to any cottage or home. Start a collection of something vintage that speaks to your heart. I collect lots of things (probably too many:-) but some of my favorites are pitchers and jars for floral arranging and vintage dishes and dinnerware. Something sentimental and not too sweet and always look for objects that are utilitarian. Mirrors add depth to a room by not only reflecting the view, but light and shadow. 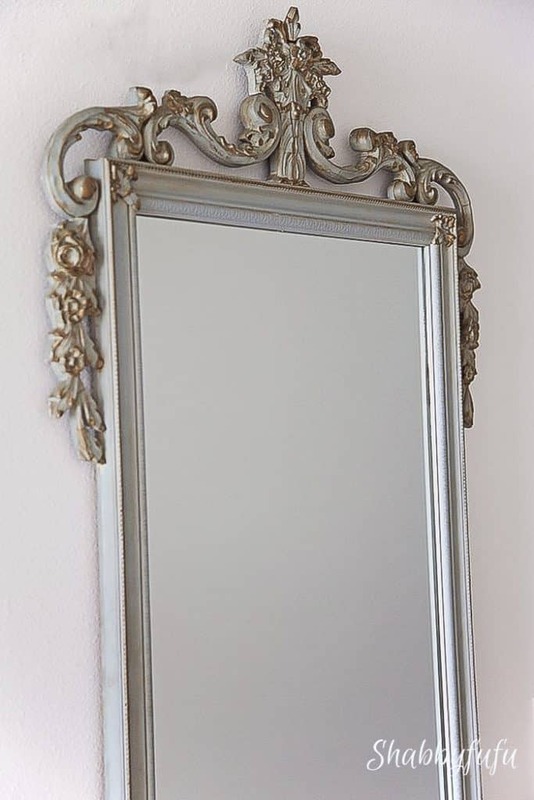 Don’t be afraid to stack mirrors and I always love a great old French mirror or one with it’s original paint. Mirrors are my favorite art in romantic style home decorating! Original old paint can be a real treasure when you come across that special piece that is authentically yummy and chipped to perfection! An old dresser or cabinet, or a bench that both are objects that have use around your home and not just sit around collecting dust. Plates are something that you use every single day, so why not make them pretty? Have a set of everyday white dishes and stack a pretty vintage plate or two on top in varying sizes. You don’t need to spend a fortune to do this and look for mismatched plates at thrift shops in similar colorways. Dishes and plates are a passion of mine as a stylist and one of the items that I will sometimes splurge on for my home and work. 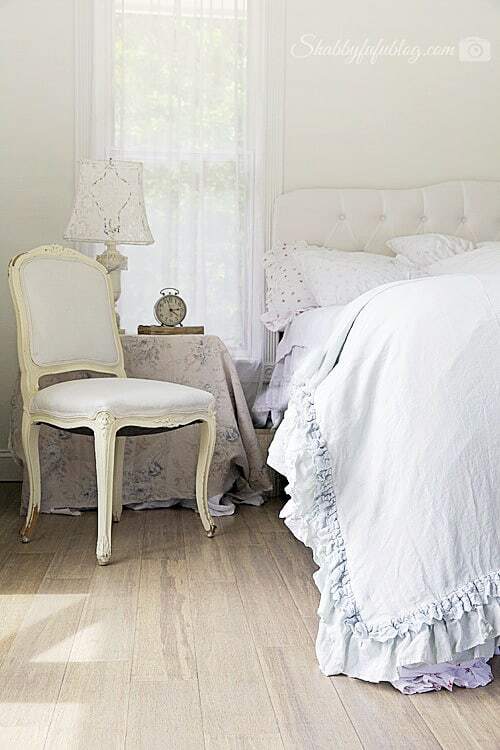 Dress your bed for sink in soft beauty but keep it light and airy enough for “him” to approve of and appreciate. Lots of pillows are an absolute must, and soft and inviting textiles. See…there is the duvet cover that does double duty around here I mentioned to you above! Give your linens a spritz of a few drops of essential oil dropped into a spray bottle of water every night before bedtime. If you love romantic style home decorating, I’d love to have you subscribe so that you don’t miss a thing! I’ve done this for years & I too have way to many collections of treasures! Your home is beautiful & you have the talent to make something old new again! Thanks for your blogs & posts, I love them!! Thank you Kippi…using objects in multiple ways is something that I enjoy doing! Love this post and thanks for some of the ideas. Love those chandeliers! Good morning Kathleen and I agree! 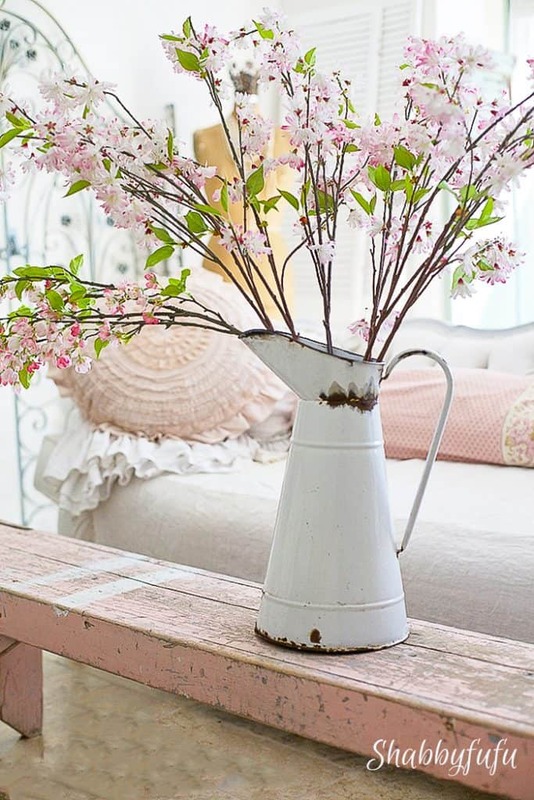 Love to incorporate a little bit of vintage into every room. In my newly remodeled bathroom I have added a favorite vintage wall mirror and vintage tole trash can, even though the room has a more modern vibe. I love your posts, all of them. I’ve been searching for a duvet like yours with the double ruffles. Where did you buy that? It’s so romantic and versatile. Thanks. Janet, I love all of these “romantic” suggestions! 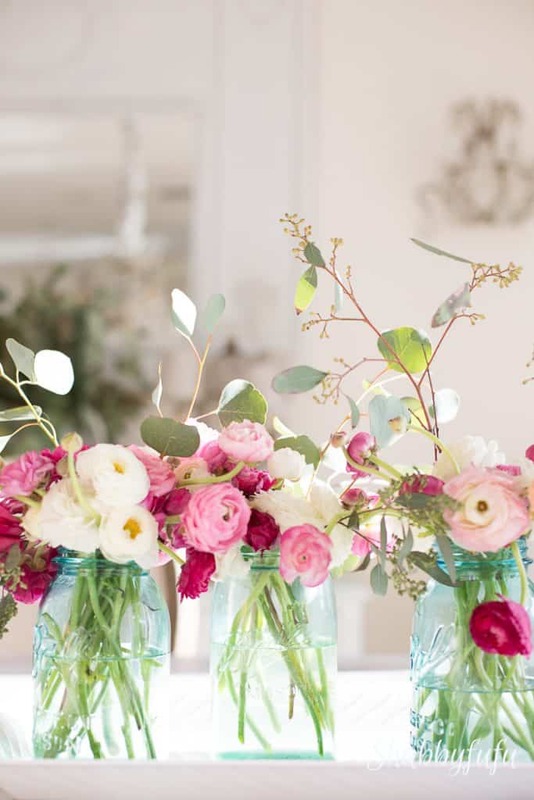 I especially love the beautiful bouquets in the blue Mason jars. A blend of romantic and country! Perfect! I pinned it! Thank you Naomi for pinning so that others might be inspired. I love Mason jars and use them daily in my kitchen!